If you live along the west coast of British Columbia you might have felt the earth move at 8:12 PM. A magnitude 3.6 quake, 26 kilometers northwest of Sechelt on the Sunshine Coast was felt by scores of local residents. Described by some as “a big truck driving by” and “definitely stronger than the last one” No reports of damage, or Tsunami warning issued. For decades seismologists have warned of a long overdue “big one” along our coast. Gentle reminders shouldn’t be ignored – the link below gives a practical check-list to consider. Read it over – you don’t have to rush out and do it all at once. Make a list, prioritize and purchase a few items every week. 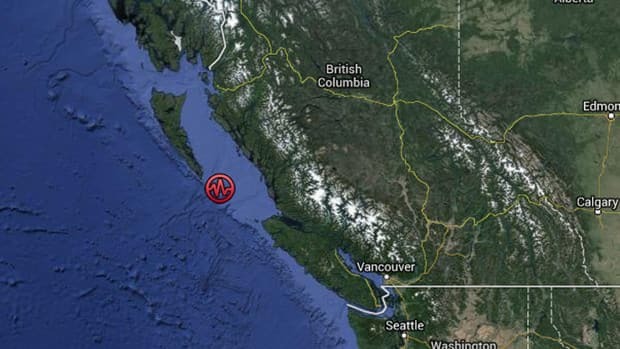 At 1:19 PST, a magnitude 6.2 earthquake struck off the coast of British Columbia. Today’s shaker was 200 Km. west – south – west of Bella Bella on B.C.’s coast, not far from the magnitude 7.2 of last October – that earthquake being the second largest recorded in Canadian history. Canada’s largest recorded quake hails from the same region; the 1949 Queen Charlotte earthquake measured 8.1 on the Richter scale. Science tells us far larger earthquakes took place before seismographic instruments were developed. The Cascadia quake of 1700, estimated at a magnitude 9 or higher. Unlike the quake last October no tsunami warnings were issued. Several after shocks registering as much as 5.5 have followed without raising an eyebrow. My guess being; the majority of B.C. residents haven’t even heard there was an earthquake. Few residents of south western B.C. are unaware of predictions for a long overdue “big one”, the only ones who seem prepared in any way are school children. At the start of each school year kids have to put together an “earthquake pack”. Their pack contains emergency numbers, a letter of comfort from parents, water, any medication needed, and non perishable food. Schools store these packs in a metal shed on the edge of their property – far removed from school buildings. Earthquake drills are as frequent as fire drills – stop, drop, and cover becoming second nature. About ten years ago my son was home sick from school. We were laying on my bed in the middle of the afternoon when I turned to him and said “stop shaking the bed”.He turned to me, without missing a beat, calm as the day was long and said “Mom, look at the door, we’re having an earthquake” Sure enough, my bedroom door was swaying back and forth. Another time I was making dinner when the kitchen window rattled – hours later the news reported an earthquake; not in a million years had it crossed my mind that anything other than a large truck had rattled that glass. Despite predictions, earthquakes are the last thing on most people’s minds. I doubt the latest 6.2 will change a thing. For myself it stands as a reminder not to be so vacant when the bed shakes or window rattles. Time to take a look at my emergency supplies and offer a link to the post I put up after the last earthquake.